AME membership includes a free subscription to the Journal of Moral Education. For students, this subscription is provided online. 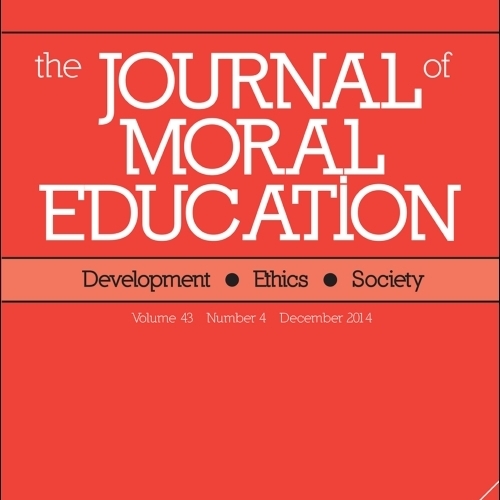 The Journal of Moral Education (a Charitable Company Limited by Guarantee) provides a unique interdisciplinary forum for the discussion and analysis of moral education and development throughout the lifespan. The journal encourages submissions across the human sciences and humanities that use a range of methodological approaches and address aspects of moral reasoning, moral emotions, motivation and moral action in various contexts (e.g., cultural, gender, family, schooling, community, leisure, work) and roles (e.g., parent, teacher, student, civic, professional). The journal encourages proposals for special issues that address a topic relevant to these aims and scope. The Journal of Moral Education Trust, established in 1997-8, is a Charity. According to its constitution its trustees are UK residents; they are currently: Jim Conroy (Chair), Neil Ferguson (Secretary/Treasurer), Brian Gates, Michael Reiss, Monica Taylor and Peter Tomlinson. The trustees are supported by an international advisory board of invited scholars. Its objectives are to support high quality innovative and scholarly activity and research including work in moral development, civics and citizenship education. Studies from a range of disciplinary and interdisciplinary perspectives are encouraged including (but not exhausted by) psychology, philosophy, sociology, anthropology, economics, history and literature. The Trust’s revenue is entirely derived from income from the Journal of Moral Education (JME), which it owns. The Journal provides a unique interdisciplinary forum for the discussion and analysis of moral education and development throughout the lifespan. The Journal is administered by an Editor and team of Assistant Editors, appointed by the Trust, and supported by an international Editorial Board. Now in its 47th year, the Journal is published quarterly; one issue a year usually focuses on a special topic. The 2017 Impact Factor for the JME is 0.825. Two international organisations – The Association for Moral Education (AME) and the Asia-Pacific Network for Moral Education (APNME) – are affiliated to the Trust. Members receive JME at a specially discounted subscription rate. There are liaison representatives between these organisations and the Trust which supports some attendance and sessions at their annual conferences. In particular, the Trust jointly sponsors the AME Grant scheme to support the attendance of junior scholars. Website www.moralcapital.info - a global portal for all aspects of moral education. Input from its users is continually welcome from any country. Research and Development – From time to time the trustees invite applications for funding for small-scale research project proposals. The last international call was 2014-16. An annual award, joint with the British Academy, is now in its fifth year. The Trust invites comments and suggestions for supporting future activities in moral education. Contact: Prof. Jim Conroy, james.conroy@glasgow.ac.uk.